Henry Ford can be credited with more than just a couple of great innovations. Some may argue that the assembly line production of automobiles, or perhaps his Model T, which revolutionized American transportation, were his greatest contributions to the world; however, something else comes to mind. "Any customer can have a car painted any color that he wants so long as it is black." It's quite clear that he was on to something: it's hard to argue that anything rivals the deep, dense shine of thick gloss black. 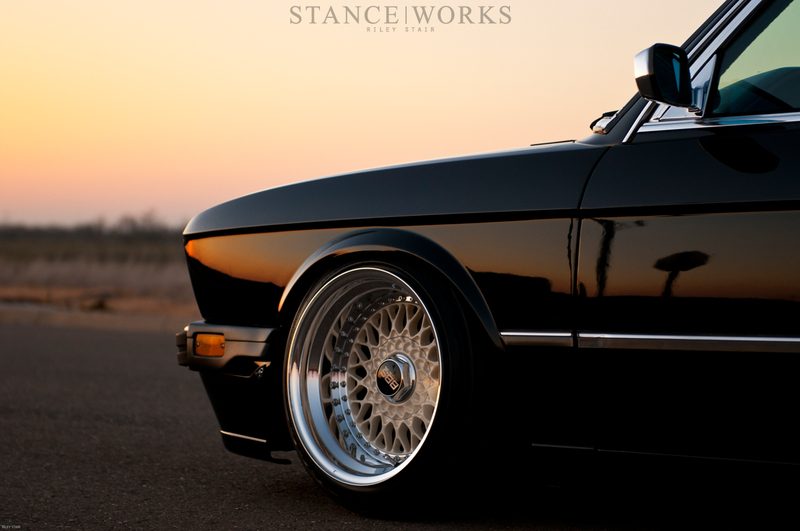 The golden evening sky illuminates the bodylines of Riley Stair's flawless E28 - the illustrious black color seems to pool upon each panel, accented by the ivory and polished accents across the car. It stands with an almost immeasurable depth - burdened by the heaviest of pigments; yet it is poised with the prowess of the queen of all colors. It begs the question: why did anyone ever bother to vary from Ford's mantra? It was only 18 months ago that Riley found himself selling his VR6-powered MK3 Jetta. Despite the lovable howl of the VR, Riley knew inside that it simply wasn't the car for him. In an act of "shopping for a new car before the old one sells" that so many of us know all too well, he stumbled across the perfect car. A 1986 535i graced the bleak white-and-blue pages of Craigslist with bullet points to make any car guy lean closer into the screen, wide-eyed with excitement. Enthusiast owned. Black on black. Rust free. All original. Does it get any better? However, the Jetta still sat in the driveway, waiting for a buyer. Mothers and wives alike have tried to teach car-loving sons and husbands that "one car must go before the next comes home," and only those of us with more sense than money have ever been able to follow the rules. Riley, however, had luck on his side. The same day he discovered the E28, a Volkswagen fiend experienced the same fate, discovering the VR6 sedan that Riley longed to get rid of. Like a dream come true, Riley sold the Jetta immediately, and that very same day, came home with an E28 to call his own. 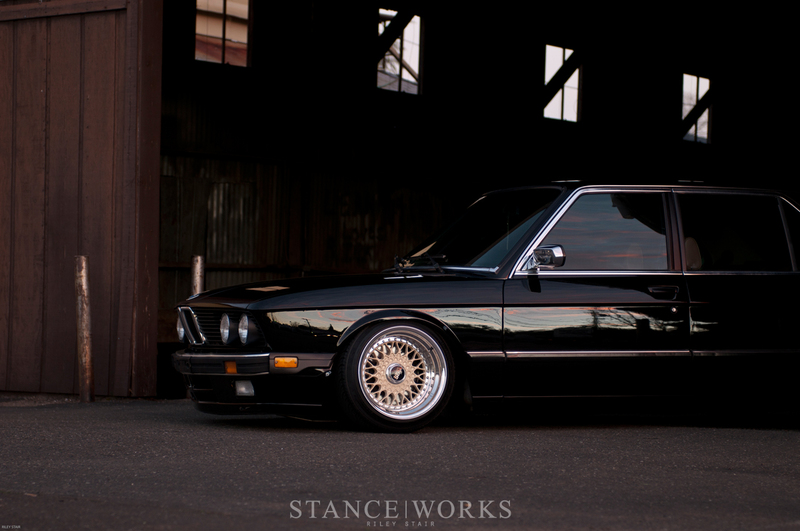 At first glance, Riley's E28 exudes simplicity; however, it's the details that make his car truly stand out. The body itself has been modified in few ways. Massaged fenders flow off of the rear quarters underneath the fresh black paint. 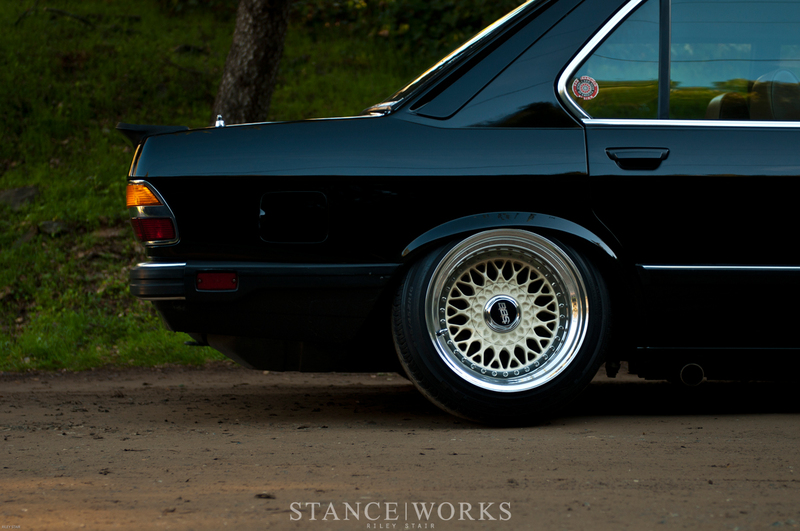 The polished trim opposes the darkness of the body, outlining the lines the E28 is known for. Fitted to the driver's door is a chrome E12 mirror, the perfect subtle accessory to the trim. Custom work has gone into the bumpers to create something entirely new: Riley calls it the "California Bumper." Tucked as close to the body as possible, the bumpers themselves were modified, as were the shrouds, shocks, and valences. The "iS" airdam needed extensive changes to mate up and fit well, but the outcome is impressive - and perhaps Riley has established a new bumper solution for all of us euro wannabes. 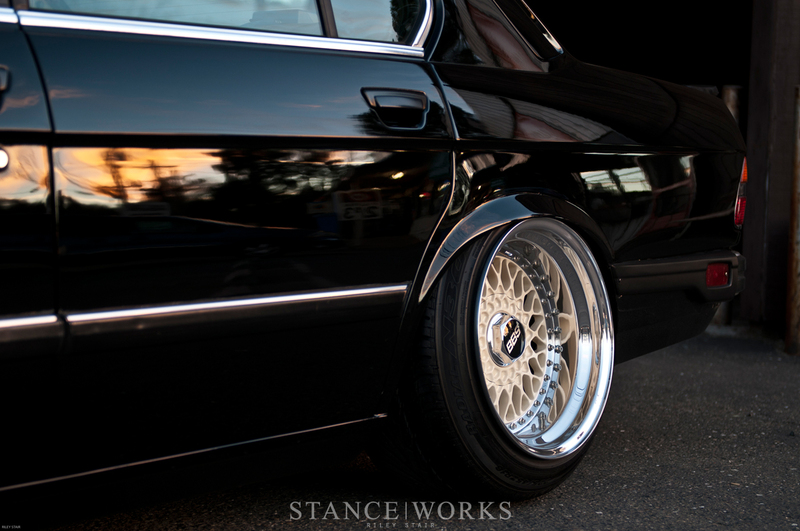 Under the massaged arches and between the tucked bumpers rests a set of truly gorgeous BBS RSs. 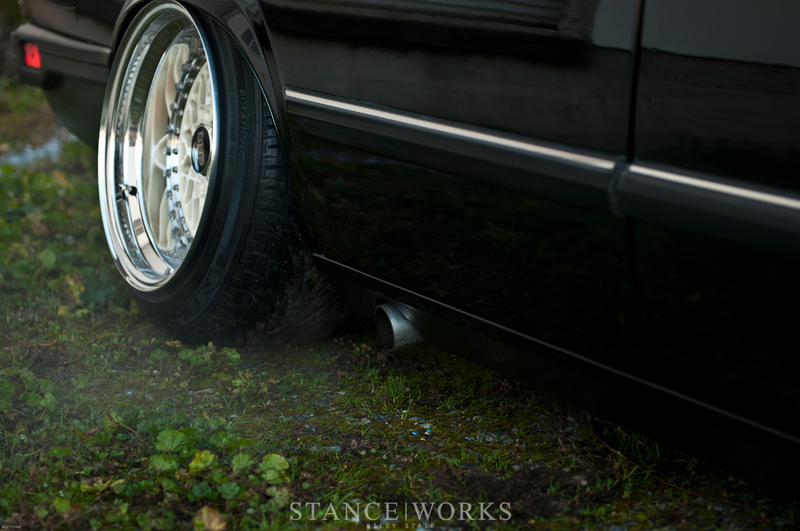 The RS211s were rebuilt out to 16x10 in the front and 16x11.5 in the rear using custom-spun Rotiform lips and barrels. The faces are powder-coated a graceful Ivory White, while the lips and hardware are all polished to a showroom shine. To fit them, and to give the '80s sedan some much needed attitude, the front wheels measure out at -6 degrees of camber, and at the rear, -8 degrees. The impressive camber and squat ride height are possible thanks to a custom set of shortened Ground Control coilovers front and rear, with a c-notch in the front to allow for upper control arm travel. The rear subframe was modified, and the front strut towers were customized to allow for such adjustment. Poly bushings and Ireland Engineering swaybars front and rear give the car some positive handling characteristics despite the lack of ground clearance. On the inside of the car, the subtlety continues. 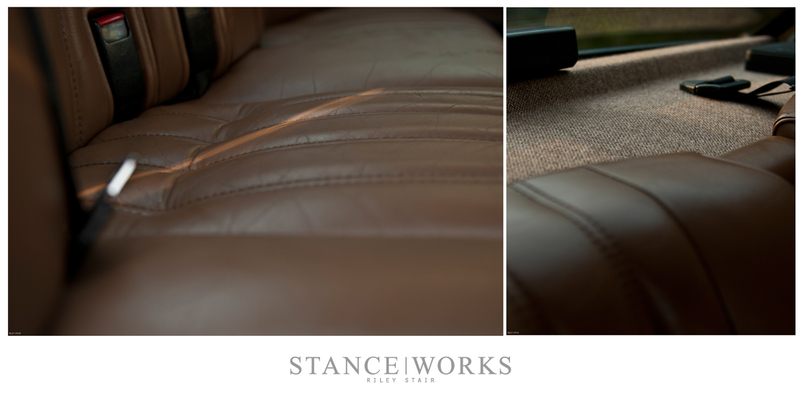 Brown tweed wraps the door cards and parcel shelf, an accent that seems simple and classy enough to be an OEM euro option. Understated, it's hard to miss but over-shined by the un-cracked dash. Thought to be a character of ancient folk-lore, Riley managed to source and install the dashboard just a few weeks back. Riley swapped the seats out front and rear for "Llama" colored counterparts. An E28 unit replaced the rear seat, but up front, E24 electric sport seats were fitted to match. 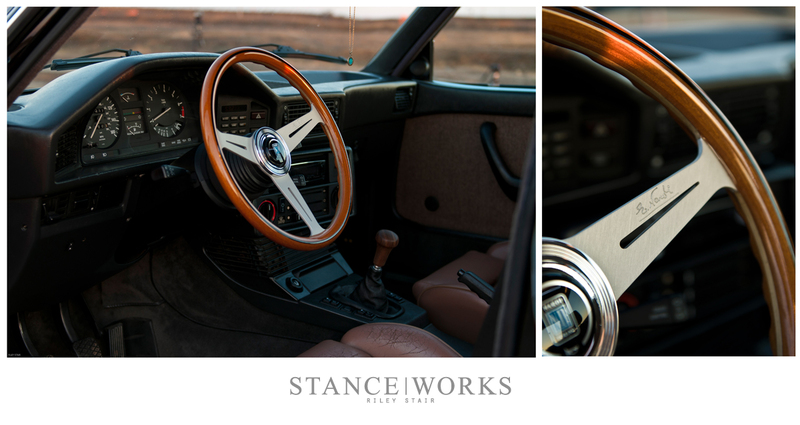 Lastly, a Nardi wheel and a woodgrain E12 shift knob polish the whole package off. The engine is next on this list, but for now, Riley is content, having seen most of his ideas through on the build. Aside from the paint work, the entire build has been a father-son project, following up their last build, a 1972 Chevy C10. "Everything has been done in our garage. I get a lot of pleasure out accomplishing the goals I set. My MO is that I am never satisfied, whether it is on my bike, with my photos, or working on my car. I always have new little ideas I want to make a reality. I want to do it different." It's obvious he's living by his own rules as well. 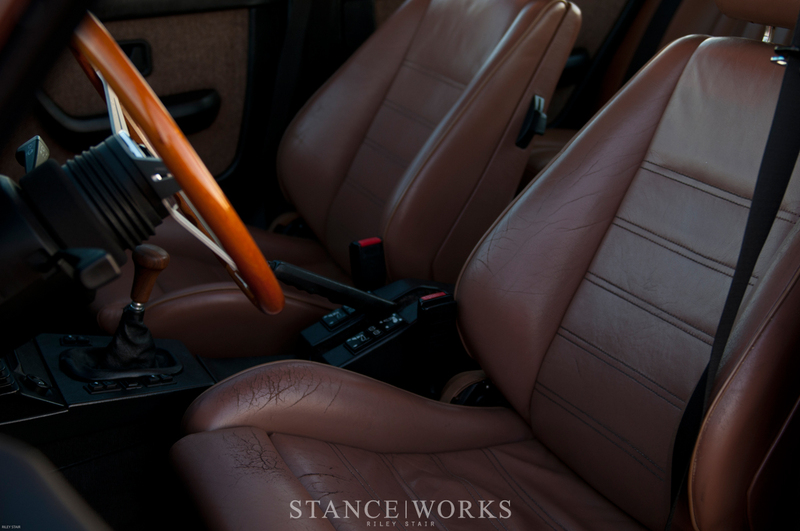 While his BMW is hardly a testament to custom fabrication and building skills, his ingenuity and desire to take the road less travelled have set his car apart from your average E28. 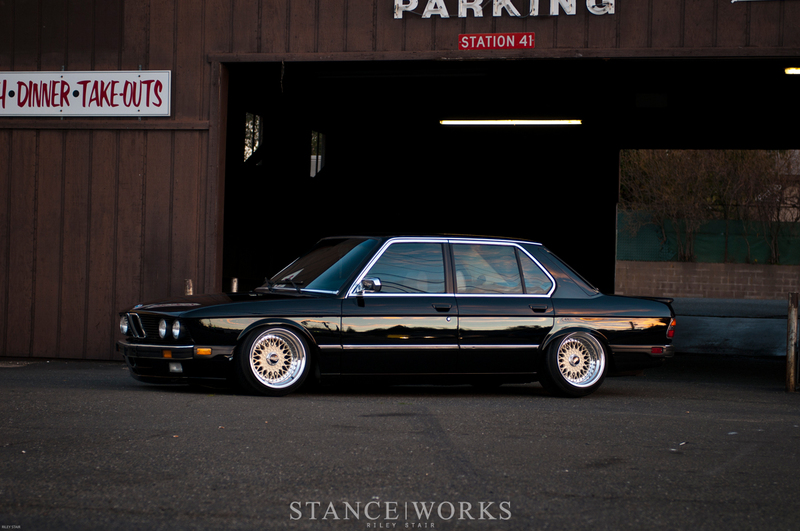 "I really love the lines of the e28 and the way that they seem to have so much character. I've always been into older cars, and I've always thought, If cars could talk, I wouldn't care too much about what the new ones had to say." The only truer words to be spoken were Ford's own. Riley is sure to be in the garage continuing the build. "While everyone enjoys recognition for the things they've done, I really can honestly say I work on my car because it's what I love to do. I appreciate the recognition, don't get me wrong, but for the most part I just kind of mind my own business and tinker on my car." As such, we'll have to wait patiently for the next time Riley and one of his builds make their way out of the woodwork. Dope to see a fellow BMX racer, and someone I used to race be a fellow bimmer fanatic. Dude is inspiration on the track. The solution for the bumpers is awesome. Creativity at its best. Absolutely beautiful. 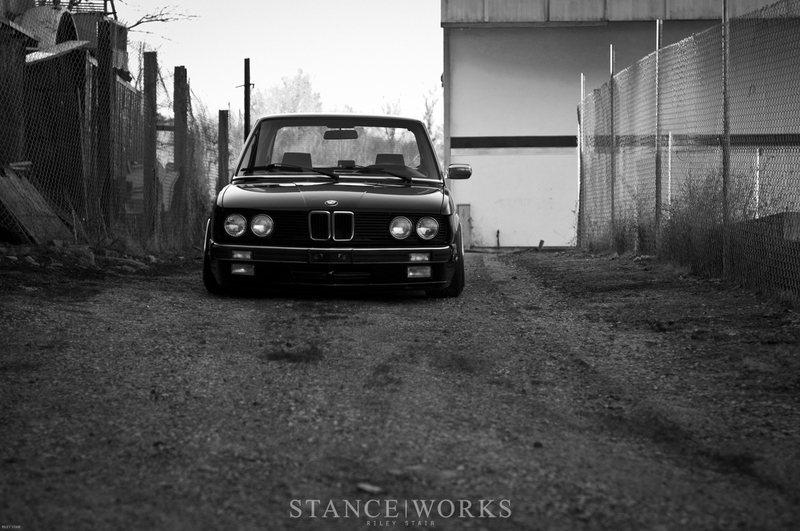 I can only hope that my E28 looks this good someday. 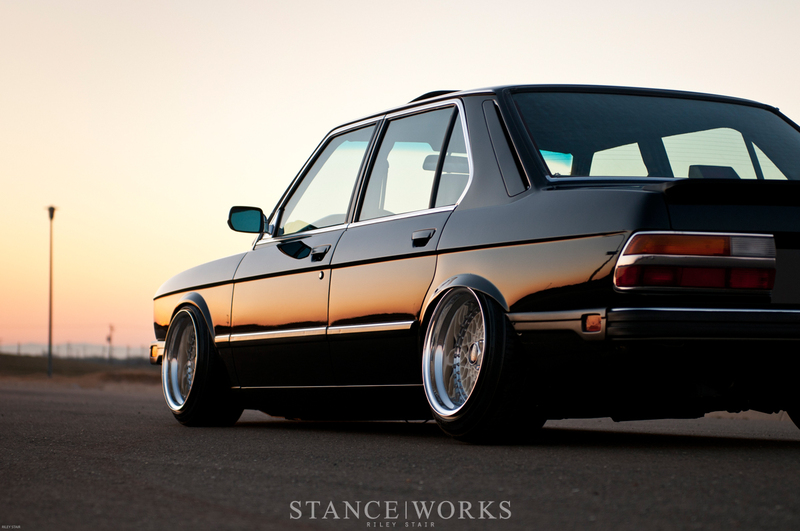 This might be my new favorite E28…or at least top 3. Stunning work. Just love the looks of your Bmw. Love it. Could really use some wet sanding though. Paint looks shiny but uneven. fantastic car.. im loving the details. Great photos too (and choice of pics for the article..). Hmm. I think Nardi Torino stuff only works in other Torino stuff – Fiats. 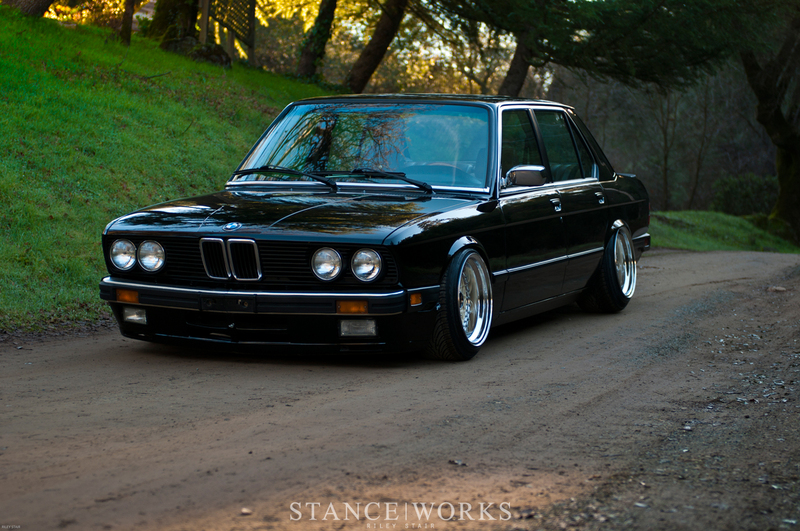 Other than that, I like E28’s. A lot. Just Beautiful, had one of these but never thought of giving it some stance. Where can you get a front spoiler like that? Umm, you forgot tire sizes. Rear pic shows 225/45 if i’m not mistaken. But what is the front please? Nice photography! And a beautiful project. It looks classic and elegant.